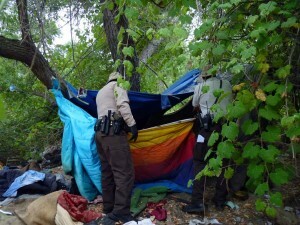 Apparently, the city feels it’s safer in jail for the homeless than sleeping in the riverbed. Of course we all know that’s just the sales pitch; the real reason is that homeless people are considered sub-human, and most people want them gone. Where? Doesn’t matter, just nowhere near ME. If the river did rise, things would work themselves out naturally. We’ve seen plenty of floods in that basin, I don’t recall anyone ever drowning because they sleeping down there. Once you stop being a “consumer”, you have no value to “society”. Yeah, I know, some of them are scary, druggies, etc. but that’s no reason to treat them all like animals that need to be rounded up and caged. Not all homeless are druggies, ripoffs and mentally impaired. I know. I was a hobo for 3 years. When I was 68 my wife, the last of my family, passed and I was kicked to the curb. $600 per month social security doesn’t afford me much luxury. I used the opportunity to travel the western US relying on my wits, my music and the many kind folks I came across while traveling the back roads. I saw the beauty of our country and felt misery in harsh weather. I experienced the best and worst of humanity in law enforcement, fellow homeless and people in general. Judge me after walking in my shoes for a while and not by what little I have. Bad planning does not make me a bad man.